Back in my Boy Scout leader days, I would take tortillas rather than bread on backpacking trips. We could pack tortillas in a plastic container without mangling them and we could use them to wrap anything. We would do sandwich wraps, breakfast wraps, and dessert wraps. I still love wraps. 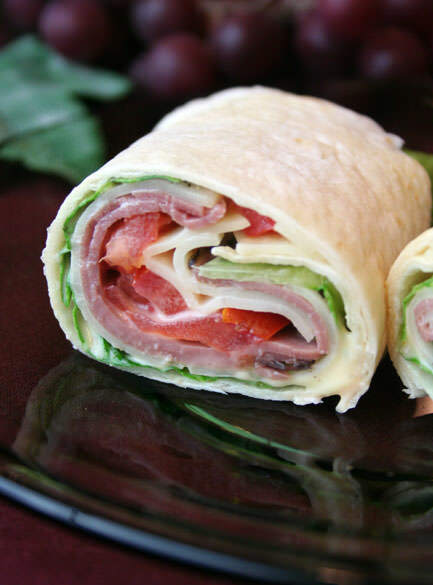 It’s easy to make sandwich wraps. Load them with meats, cheese, and veggies to suit. Spread them with mayonnaise or a sandwich spread or drizzle them with dressing. For breakfast, you can fill them with scrambled eggs, grated cheese, and snipped bacon or crumbled sausage. Add salsa if you like for a Tex-Mex breakfast burrito. You can buy tortillas in the grocery store or make them yourself with our easy tortilla mixes. 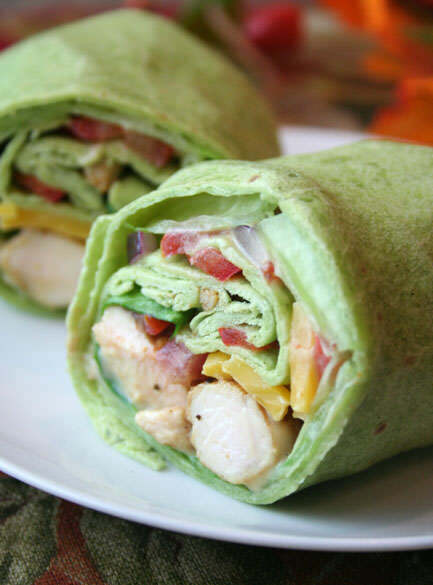 Here are four of our favorite wraps–great for a quick lunch or an easy dinner. You can make an open-ended wrap or a closed one. And everyone seems to have their own best way to wrap a wrap. This is how we wrap a wrap. 1. Smear sandwich spread within an inch of the perimeter of the tortilla. 2. Lay sandwich goodies in a wide swath down the center of the tortilla and to within a couple inches of the left and right edges—kind of a rough rectangle. 3. To make a closed end wrap, fold both the right and the left edges over the goodies and roll from the bottom. To make an open-ended wrap, fold only one edge. If we make a closed end wrap, we cut the wrap in two and eat half at a time. If the tortilla is a little stiff and hard to wrap and keep closed, try microwaving the tortilla under a paper towel for 15 to 20 seconds. It will be more pliable. 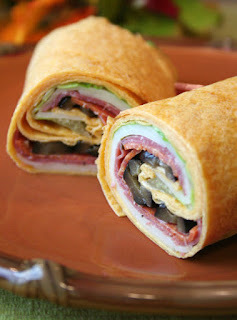 In our test kitchen, we made wraps both with mayonnaise and with sandwich spreads. Everyone much preferred the wraps made with spreads. The extra flavor and zest really made the wrap. As of this writing, we have 14 different spreads—really good spreads. Please try the whipped mustard spreads. They’re incredibly good. Grilled chicken or leftover turkey makes a wonderful wrap. Load it up as you like. Pick a sandwich spread or whipped mustard spread that gives your wraps some zip. The spinach tortillas can be purchased in the grocery store. 1. Spread the sandwich spread lightly on the tortilla. 2. Place romaine lettuce on top of the spread. Add the cheese and chicken. Add the remaining ingredients in your order of choice. 3. To fold the wrap, fold in the sides of the tortilla and then roll from the bottom up. Cut the wraps in half. how to spatchcock a chicken? This Italian wrap gets its zest from the Italian dressing and pepper jack cheese. The pastrami and pepperoni give it a lot of flavor. 1. Spread Italian dressing on the tortilla. 2. Place pastrami and pepperoni slices over the dressing. Add the tomato slices and olives. Top with grated cheese and more dressing if you like. This is a great wrap for summer. It’s light and refreshing, healthy and flavorful. This is a great wrap for a picnic or a lunch in the shade at the park. 1. 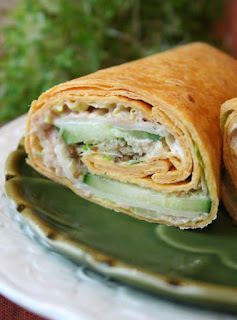 Mix the tuna, celery, onion powder, and mayonnaise together to make a tuna salad filling. 2. Spread the filling on the tortilla. Add a slice or two of provolone cheese. Layer with cucumbers and sprouts. 2. Place romaine lettuce on top of the spread. Add the beef and cheese. Add the tomato slices.